CALGARY – As the Calgary Flames were locked in a scoreless battle with the Anaheim Ducks on Thursday night, suspended forward Rene Bourque was leaving the Scotiabank Saddledome as a member of the Montreal Canadiens. The Flames were unaware that their teammate of the last 3 1/2 seasons had been dealt to the Canadiens during the 1-0 overtime victory -- they weren't notified of the trade that sent Bourque to the Canadiens in exchange for former Flame Michael Cammalleri until after the game. Bourque was at the Saddledome but not in uniform -- he was sitting out the fourth of a five-game suspension for elbowing Washington's Nicklas Backstrom in the head eight days earlier. The trade -- and its timing -- caught the Flames by surprise. "Usually those things don't happen mid-game," said Cory Sarich, teammates with Cammalleri during his previous stint in Calgary. 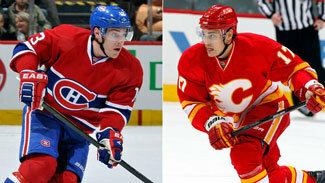 "(Bourque's) a nice guy, really good teammate and I wish him well. We know what Cammi's all about. He's going to help our team." Much like Sarich's reaction, the news was met with mixed emotions from Bourque's now-former teammates. "I was surprised," captain Jarome Iginla said. "It's always a shock. Bourque is a big part of this room and we're all friends with him. He's a big, scoring winger. He's going to do great. Cammi, he's played with a lot of us too. He's a very good player too. It's just different. It's always friends going both ways." Iginla expressed excitement at the thought of adding Cammalleri, but also had concern for Bourque, who didn't have the opportunity to offer a farewell to his friends on the team. "On one hand you're excited but on the other hand we haven't had a chance to talk to Bourque," said Iginla, who added that he stayed in close contact with Cammalleri after the speedy forward signed with Montreal in the summer of 2009. "It's bittersweet. It's exciting, but it's hard to see him go." Curtis Glencross, Bourque's road roommate, expressed similar sentiments. "Cammi's been here before. We know Cammi," Glencross said. "When you lose a guy like Bourque, he's one of your heart-and-soul guys. You hate to see him go, but it's part of the business." Cammalleri is no stranger to Calgary. He spent 2008-09 with the Flames and posted career highs with 39 goals and 82 points before inking a long-term deal with Montreal. Though he's found the back of the net just nine times in Montreal this season, Iginla is hoping a reunion will reignite the chemistry they shared in a Flames jersey. "We had good chemistry," Iginla said. "I don't know where he's going to play, but he's a great power-play guy. He has the knack to always find ways to get open, and his release is second-to-none. He's a very competitive guy. I enjoyed playing with him and had success with him." In the end, the move will benefit both organizations, Iginla believes. "Both teams got very good players," Iginla said. "Hopefully it's one that will work really well for both teams."